In addition, Dennis Jones of Peabody’s Colorado Conservancy Group also was recognized with the state’s Dr. James Pendleton Award for outstanding work to maintain water quality in the semi-arid climate of Northwest Colorado. 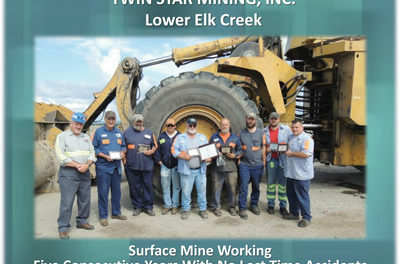 The award is among the highest individual honors presented by the Colorado Department of Natural Resources and the Division of Reclamation, Mining and Safety. Peabody’s environmental and operations teams work with academics, regulators and community stakeholders to restore Colorado lands to a condition that is typically four times more productive for livestock grazing than native range. Restored lands provide a haven for deer and elk, offering some of the highest densities of big game in the region. The team developed unique soil handling, fencing and irrigation techniques for the state’s high elevations, reestablished native woody plants and aspen trees, and partnered with the Colorado Division of Wildlife, the U.S. Forest Service, U.S. Office of Surface Mining and Colorado Division of Reclamation, Mining and Safety to create vital breeding, nesting and brood-rearing habitat for the potentially threatened Columbian Sharp-tailed Grouse. Under Jones’ leadership, the company also created a stream and ground water monitoring system that is one of the most comprehensive in Colorado. An advanced network spans dozens of stream sites and springs and more than 90 groundwater monitoring wells, which provide necessary data to maintain water quality to high standards. Jones is among nearly a dozen Peabody employees who have been individually honored by state, regional and national authorities for environmental excellence. Worldwide, Peabody earned more than 30 awards for safety, environmental and financial performance this past year. The company’s environmental programs in Colorado have earned widespread state and national recognition, including honors since 1994 and national honors for land restoration from the U.S. Department of the Interior in 2000 and 2006.